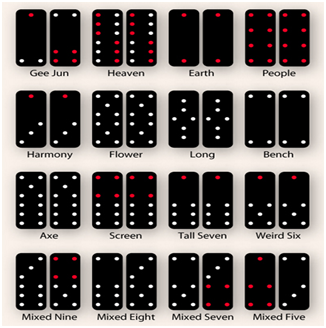 “Pai Gow” is a Chinese game played with a set of 32 Chinese dominoes. It is played openly in major casinos in China including Macau; the United States prominently in Las Vegas, Nevada; Australia and New Zealand. Pai gow poker also called double-hand poker is an American version of Pai Gow (developed by Sam Torosian in 1980) and is played with standard 52 card deck bearing poker hand values. Thus Pai Gow Poker is a kind of wedlock between cards and dominoes. Pai gow, the oldest of the casino games easily pre-dates roulette and baccarat. The concept is the same as pai gow poker, where both player and banker make high and low hands, and then compare against each other. What makes pai gow to understand is the order of hands and tiles seems to memorize. There are special ways in which a hand can score more than nine points. The double-one tiles and double-six tiles are known as the Day and Teen tiles, respectively. If a Day or Teen tile is used with an eight, the pair is worth ten instead of the usual zero. This is called a Gong. If a Day or Teen tile is used with a nine, the hand is worth eleven instead of one. This is called a Wong. But a Day or Teen tile used with a ten is only worth two, not twelve; this is because only eights and nines can be combined with Days or Teens for higher values. All tiles must be kept on the table. A player may not show his/her tiles to or discuss them with any other player at any time while the game is in play. The casino dealer shuffles the tiles thoroughly and stacks them in rows, with four tiles in row. The total count of dice points showing, after the dice cup is opened, determines which seated player receives his/her tiles and action first. The table positions are determined with the player-dealer designated as seat one and proceeds counter clockwise from the player-dealer. The player-dealer receives his/her tiles first when the dice points total, nine (9) or seventeen (17). When the player-dealer receives his/her tiles first, the player to his/her right receives action first. All bets must be placed before the dice cup is opened. The casino dealer deals four tiles to every seat, regardless of whether a bet has been made at each seat. The casino dealer retrieves tiles dealt to empty seats, placing them in an area in front of his/her dealer tray. Players set their tiles into two hands, creating the best hands possible. Both hands are placed in front of players’ bets. Players may, if they wish, leave all four tiles flat down/in one stack, in which case the casino sets them in the “House” way. Once player-dealer’s hand is set, the casino dealer will turn over each player’s hand to compare against the player-dealer, beginning with the player who has the action button and proceeding counter clockwise. The casino dealer declares whether each hand is a winning, losing or “push” hand. If a player wins, the casino dealer leaves the tiles two by two in the shape of the letter “T,” in front of the player’s spot. If a player loses, the casino dealer brings the losing bet forward in front of the betting circle (stacking one tile on top of the other three tiles). If a player pushes, the casino dealer leaves the money alone, but brings the tiles toward the casino dealer’s tray. Each player is allowed to shake the dice 6 times per round. The first bank must bank at least 40% of the live action (including corporation action buy) to be able to make the decision on setting the bank hand. For example: Front bank $1,000, Second bank covers behind. If the action is more than $2,500, the second bank makes decision, if the action is less than $2,500, the front bank makes decision, and if is exactly $2,500 action, the front bank makes decision. Pai gow is loosely translated as “make nine” or “card nine”. That means the best a hand can score is nine. To find the value of a hand, simply add the total number of pips on the two tiles, and drop tenth place. So for instance, a 1-3 tile (a tile with one pip on one end and three pips on the other, for a total of four pips) used with a 2-3 tile (with five total pips) will score nine, since four plus five is nine. A 2-3 tile with a 5-6 tile will score six, and not sixteen, as the “1” in “16” is dropped. And a 5-5 tile with a 4-6 tile will score zero, since ten plus ten is twenty, and twenty reduces to zero when the tens place is dropped. The goal of the game is for the seated player to make two hands; out of the four tiles they receive that rank higher than the player-dealer. The seated player wins if both of his/her hands rank higher than the player-dealer hands. In situations where one hand is ranked higher and the other is lower, it is called a “push” and both the player-dealer’s and the opponent’s bets are returned. The player-dealer wins in all situations where the both of the opponent’s hands are identical to his/her own. Pai Go Poker is relatively slow-paced game and appeals to players who prefer more leisurely games. Basically, up to seven players receive seven cards apiece out of a deck of 52 cards plus one joker which is used as an ace, or to complete a straight or any flush. Standard poker ranking rules are followed with one strange exception — the A2345 straight (known as “the wheel”) is considered the second highest straight though some casinos have dropped this rule. Five-card hands use standard poker hand rankings with one exception: in most Nevada casinos, the hand A-2-3-4-5 ranks above a king-high straight, but below the ace-high straight A-K-Q-J-10. At most casinos in California and Michigan this rule doesn’t apply; the A-2-3-4-5 is the lowest possible straight. The standard payout for any winning hand is simple – it is even money (1-to-1). In these situations, the House will take a fee of 5%. Of course, you also have the option of placing a Bonus Bet before the deal, at which point the criterion for determining the degree of a win on this Bonus Bet, if any, would be the entire seven-card hand you possess. There are a number of variations of pai gow poker that are popular in casino today. These variations were mainly formulated in 2004 – 2009. Pai Gow Mania was the first variation to be created which allows for two side bets instead of the traditional one side bet per hand. 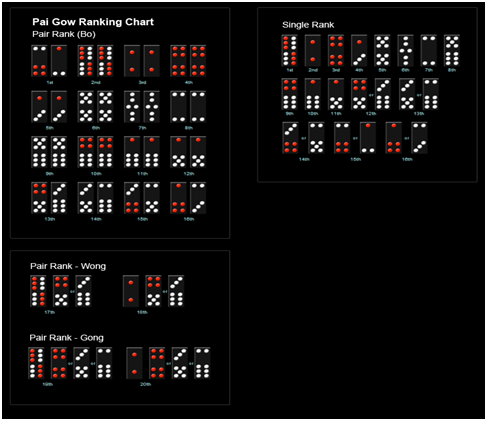 Fortune Pai Gow is another variation which allows players to make a side bet on a poker hand ranking of trips or better. This is one of the most popular variations. Similar to fortune pai gow, is Emperors Challenge which also allows a side bet on a 7 card pai gow (no hand). The final variation of the game developed was Pai Gow progressive, which is the addition of a progressive jackpot to the pai gow table. This jackpot is the combined of $1 side bets placed by players during the play. Pai Gow Insurance is a new version of Pai Gow Poker offered at Station Casinos in Las Vegas. This game first debuted at Red Rock in the summer of 2008 and has since grown in popularity. Pai Gow Insurance is played exactly like Pai Gow Poker; however, there is an optional side-bet which pays out if a player is dealt a Pai Gow hand. A Pai Gow hand means a non ranking hand (high card only) meaning no pairs, no straights, no flushes. Pai Gow Insurance side-bets offered by Las Vegas Casinos are: Red Rock, Aliante Station, Palace Station, Boulder Station, Texas Station and Sunset Station. As of now there are no reputable or safe options for playing Pai Gow with an insurance side bet online at any other casino.